Charlotte Tilbury is a world-renowned makeup artist, with a fun personality to watch and to listen to. I first saw Charlotte at work thanks to Lisa Eldridge, click here to view the video of Charlotte’s guest appearance on the House of Eldridge. You probably heard about her Feline Flick signature look, I really wish I could wear this dramatic full eyeliner look at my age but despite her claiming that it is an universal look for everyone I am not 100% convinced I can still pull it off at my age, but I know it’s also a matter of personality and whole attitude or look. I tried to find out how old she was just to see if that would give me enough confidence to wear it, I believe she is around 40 if I understand this article. So age shouldn’t be a too bigger issue since she wears it every day, then of course we don’t have the same job, wearing this look to an office full of geeks is maybe not the most appropriate thing to do… But how can I say that it won’t suit me if I don’t try it… Shall I take this as a challenge and do it for the next review of her makeup products ? I will for sure and I hope it works out ! 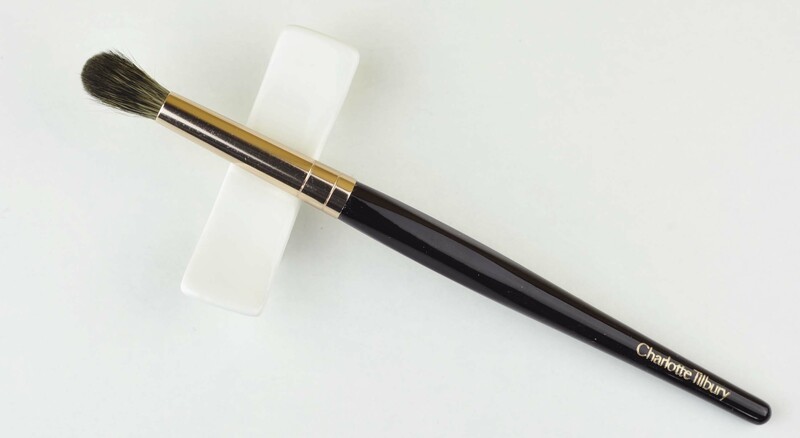 The handles are burgundy coloured wood, the ferrules rose gold, the blush brush feels quite heavy and sturdy since it’s so thick. 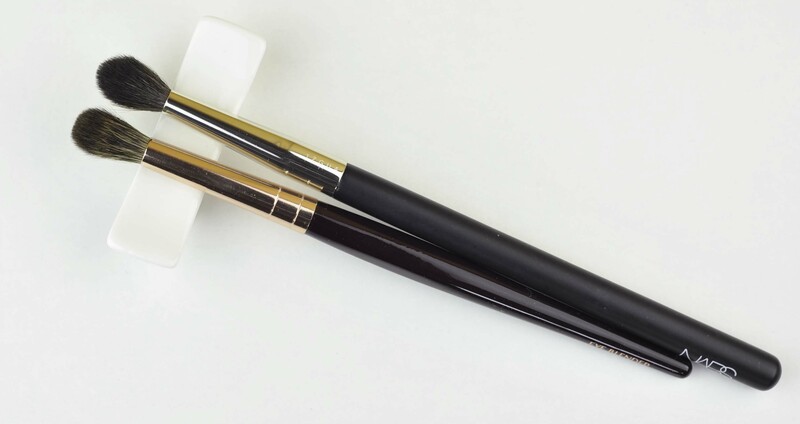 In terms of weight and handle length, the two eyeshadow brushes are just in between Mac brushes and Hakuhodos placing them approx in the middle of the two brands. She had the idea of faceted brushes to not roll off the dressing table, glad she didn’t decide to put magnets inside the ferrules like Rae Morris did – relief! I appreciate the fact that her logo is engraved on the handle and not only painted, the logos tend to fade away or disappear and that’s sad specially when the brushes are higher-end, the fact they are engraved will make them last longer or endure a regular usage. Her brushes perform well, no question about that. 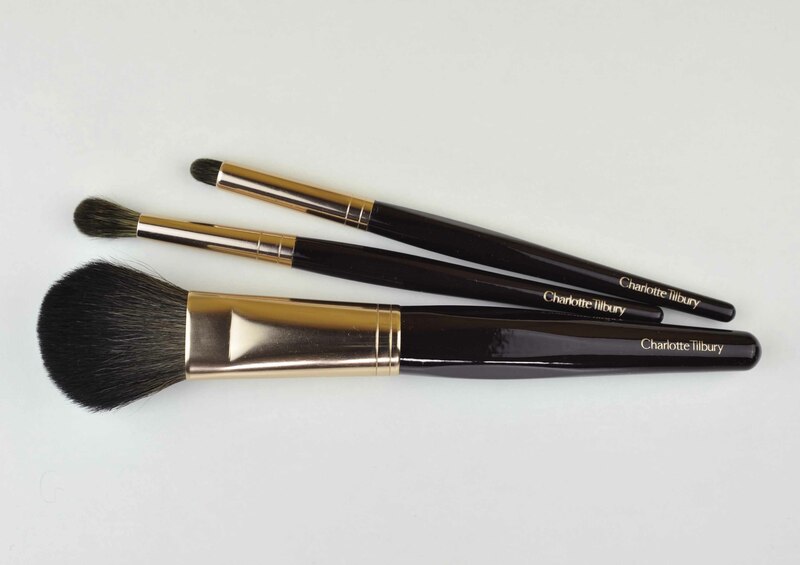 In terms of quality it will depend where you come from, if you come from Chanel, Dior, Piccasso Brush, Edward Bess brushes, you may find these CT brushes could be equivalent or even an improvement in some cases. “Performance rating” can be dissociated from “quality rating”, it’s not that easy to apply a general unique rating to a makeup brush anyway, too many factors have to be taken into consideration. You can rate the quality of the hair, the quality of the handle, of the ferrule, you can also rate how it performs with delicate skin, or with heavy pigments, how easy it is to work with, and even if you rate the ergonomics, it’s too personal to fit all. 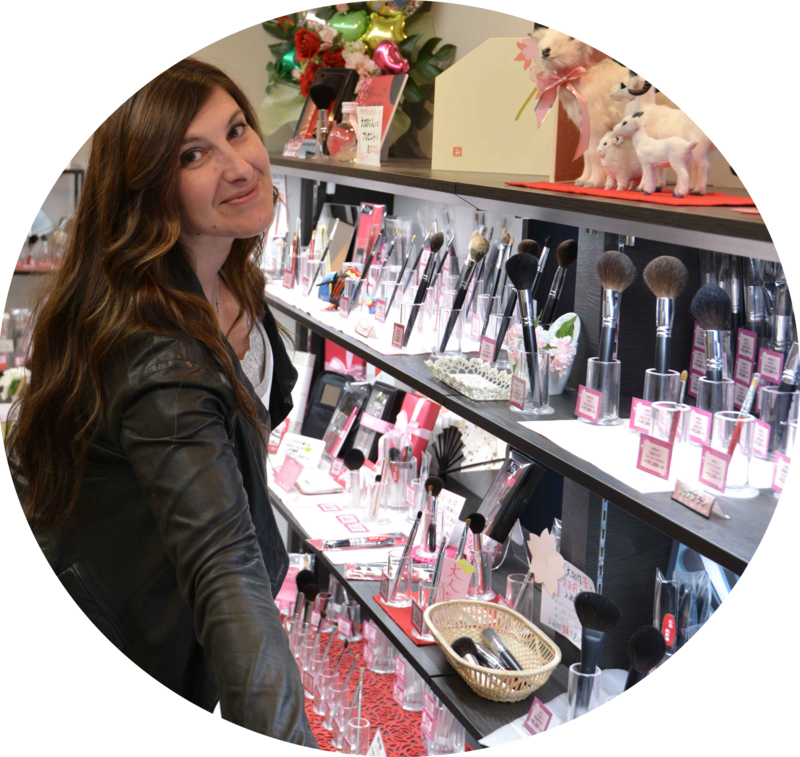 A makeup artist will have different needs than a private consumer. My needs are those of a makeup lover with very sensitive skin who is looking for efficiency but with a touch of luxury and of course I am a brush collector if you didn’t notice 😉 To be honest with you, for the price, I’d rather use a Japanese hand made brush but I will of course get into details and explain what I like and dislike about this range, keeping in mind that the main idea behind her collection was to create a fool-proof, quick and easy line for busy women -so I understood- and this, she has achieved. If you have been reading my previous posts, you may have noticed that over the past months I have purchased quite a few goat brushes because I love the efficiency of “rougher” materials – they are often easier to use and deliver faster applications than much softer versions. If I go for rougher materials they still have to be soft enough for a daily use on my very delicate skin and that is not that easy to find. 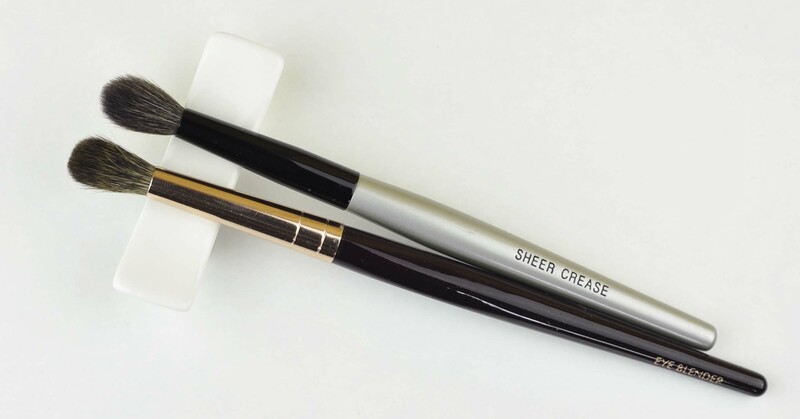 I love the Kashoen brushes for their soft and efficient goat hair but I have problems with the final price versus quality, because they don’t have the “perfection” of other Japanese handmade brushes and their higher price tag made me cringe. I felt the CT brushes could be great candidates for efficient brushes and I didn’t mind at all getting some of them, do I regret it ? I partially don’t, but let me tell you why below. 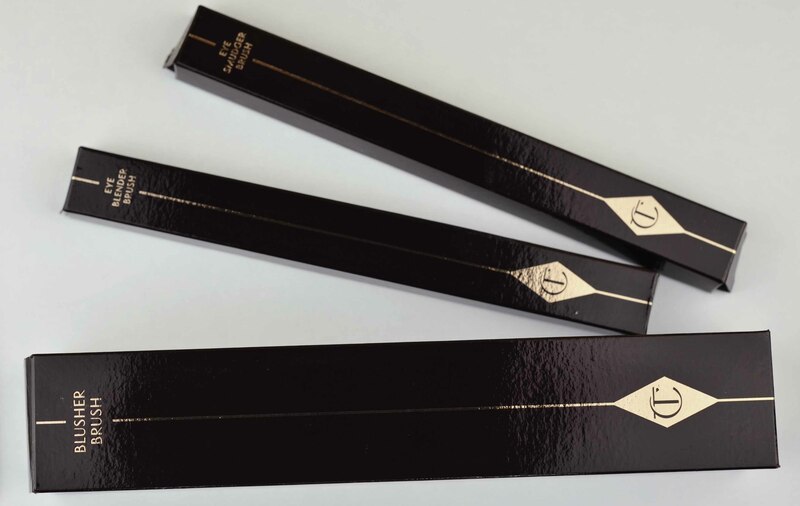 The lower lashline : the application will be roughly 2 to 3 mm wide, it will be fine with medium colours but with much darker or black colours it will be a little bit too dramatic for an office application. Outside of the office for a more dramatic smokey eye, no worries. It does apply the eyeshadow very evenly, very efficiently and with more intensity than similar squirrel alternatives. It is just soft enough for me to use it, we are just in the borderline here but that’s fine, I can deal with it since it is very efficient so I need less strokes to complete the result. The N°7 brush size is also great but it’s too rough when it reaches the outer corner of the lashline where it’s more sensitive for me, then it hurts too much, I just use this N°7 when I need to blend a harsh pencil. 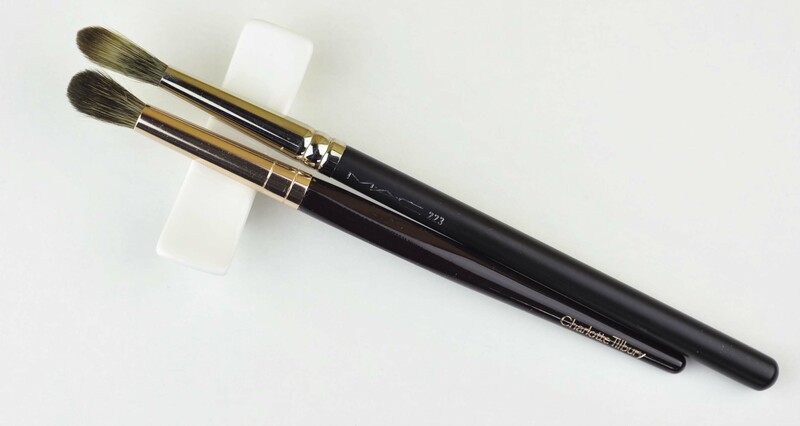 The Chanel 24 is very soft but I use it only around the tear duck with highlighter colors or sparkles, it doesn’t have much “smudging” power, it’s very thin and flexible. I mix sparkles (TF) with creamy long-lasting pencil or paintpot on the back of my hand then pick the product with the Chanel brush then apply. The outer V : great for that precise application, picks enough product to do a single “pick and apply” and then blends the corners efficiently. For more sensitive days I use the Suqqu M or the similar Yojiya but I have no complaints about this one, I love that it has a flatter surface that doesn’t feel scratchy, I don’t need to force on the blending so that’s a good thing, this one has a great efficiency factor with just enough softness, that said, I do prefer other brushes like the Yojiya or the Suqqu M.
The mobile eyelid : I often apply a dark eyeshadow along the mobile lid very close to the lash line and then blend upwards, this is how I like to do soft smokey eye looks for the day. For that it’s the perfect size for me and with a lot of blending power in this one ! 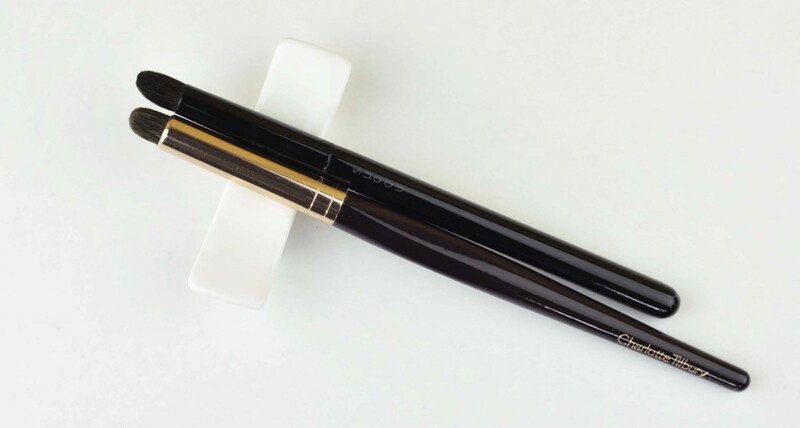 I thought it could be similar in size to the Suqqu S but the CT is firmer, not as soft and will apply the shadow with more intensity versus the Suqqu finish which is more natural. This is a quite a soft brush, feels nice on the skin and is dense, firm and flat enough for me to use it as a soft blender. But I don’t. When I grab a blender brush, I am thinking more of an “even harder” blender like the Hakuhodo 214 for example. Some would say that I “destroy” the look, I don’t feel like I do, it’s just the way I love to finish my looks : very blended ! The only problem with the Nars or the Paula Dorf is that for me and my painful lids they are not the most pleasant brushes. But yes, they apply and diffuse perfectly the colour, in fact the Nars and Paula Dorf are extremely similar brushes, nearly twins. So, I don’t use this CT for crease or for blending but I use this CT for something a bit new to me that I just discovered last week. When I apply matte shadows sometimes I think I am missing some “oomph”, I have discovered a few shadows that add shine (micro sparkles without shouting shimmer or metallic finish), for example the sheerest color from the new pink trio from Tom Ford, or the white shade from the old Serge Lutens palette, if I apply a sheer wash of one of these shadows on top of the finished eye look it brings it to life. For that this is a great brush because it will just apply the wash of color without altering the application underneath. It’s not scratchy at all and it does have enough blending capabilities to work with a wide array of textures, the “fool-proof” factor is very well met. Here is a size comparison with the Mac 217 and the Edward Bess blenders. I love the Mac, still going good after all these years together… the Edward Bess is a very efficient blender but unfortunately I have here once again a problem with the softness. Ok, so yes, it is efficient. I won’t use it to give a “polished” look to the cheeks because rubbing this against my sensitive cheeks is not very pleasant at all, if I do her swish and pop technique (watch the video if you want to see what she means by that, the pop is followed by a shy ouch. It does poke on my skin, if I use it briefly and don’t force on it, it works nicely and I can just tolerate it. In a way I feel like I am no good for most of the brush companies because my reviews are tough but what pokes on my skin may not poke on yours, that’s why I try to show you other brushes with similar hair quality. It has the perfect density and shape to make this brush also very fool-proof but still… there is room for a little bit more softness in there. Compared to many other brushes, it is too expensive for the quality of hair and it has shed a bit since I got it, I have been using it very regularly for the purpose of the review. The Louise Young LY 04 is extremely similar in hair quality so in case you own it, you know what to expect, I think the LY feels slightly softer but it also sheds. Another similar brush in terms of hair quality is the Trish McEvoy which is made in China, I wouldn’t be surprised at all if the hair comes from the same source. As you see the Trish looks like her Powder and Sculpt brush, that’s why I didn’t get it, I know this has never saved me from buying similar looking brushes but the quality of the hair does not really appeal to me. 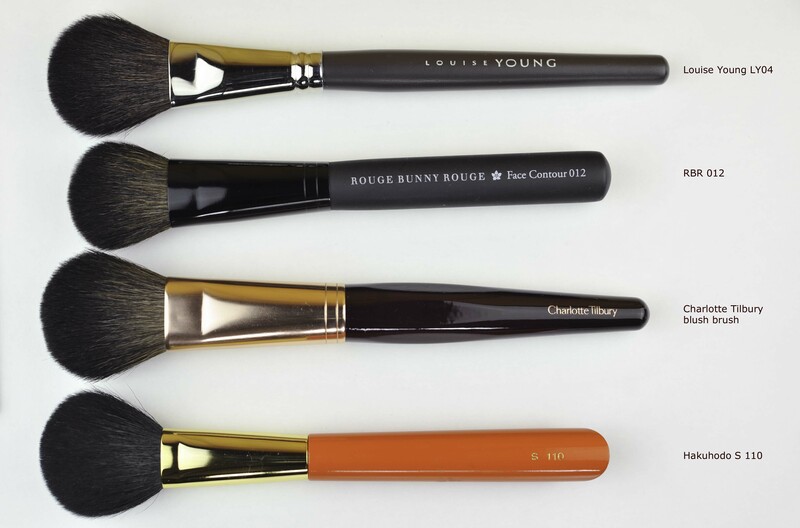 The RBR 012 reminds me of the CT blush brush because it has similar density, but the RBR is softer. I prefer the Hakuhodo goat hair better than the CT, even though Charlotte’s brushes are probably made with squirrel hair – I am not sure but compared to other similar hair it looks like squirrel hair to me- but it is not that soft at all. I didn’t know that squirrel hair could poke until I tried Piccasso brushes by the way so it’s not because it is squirrel hair that it will always be soft ! Yes for the efficiency but the price and hair quality of the face brushes are not very appealing. I don’t regret the eyeshadow brushes but the blush brush I really wish it would be a bit more pleasant to use, shame because the shape and density are spot on for a very multi-purpose brush. You can get them in Selfridges, or Charlotte Tilbury’s website or also Net-a-porter. I hope that was helpful to you and thanks for reading ! Charlotte Tilbury’s brushes was last modified: September 24th, 2014 by Sonia G.
Hmm i only know the da Vinci brushes are made in Germany. 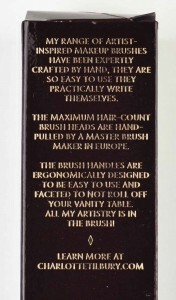 When da Vinci is the producer of these brushes I understand the fact that they are not that soft like we are used to. I had a squirrel eye brush and it was really scratchy. Sure I can’t say all brushes are scratchy from them but I prefer the uncuted brushes from Japanese brands. Thank you very much for the review. CT’s new own makeup line has been highly anticipated, so it is very interesting to get non-sales information about her products. 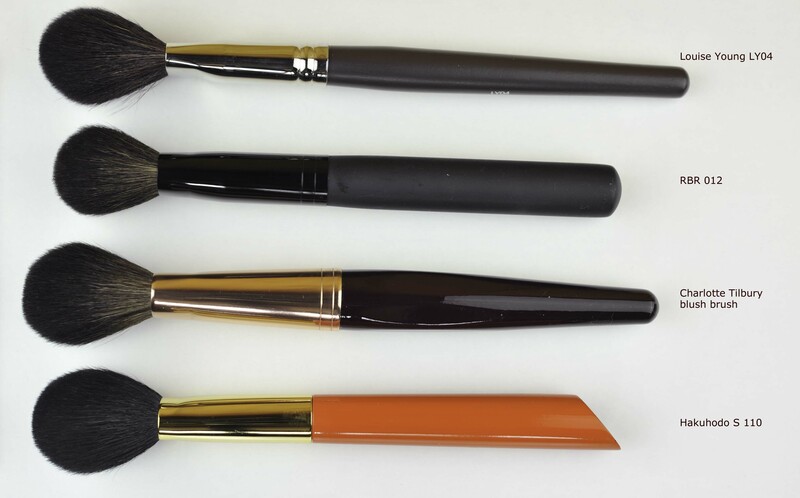 I think you are right that these brushes are targeted at a different brush consumer group than you and your lion-paw-brush-loving blog readers, for whom they may be very helpful for daily makeup application. I will give them a miss. 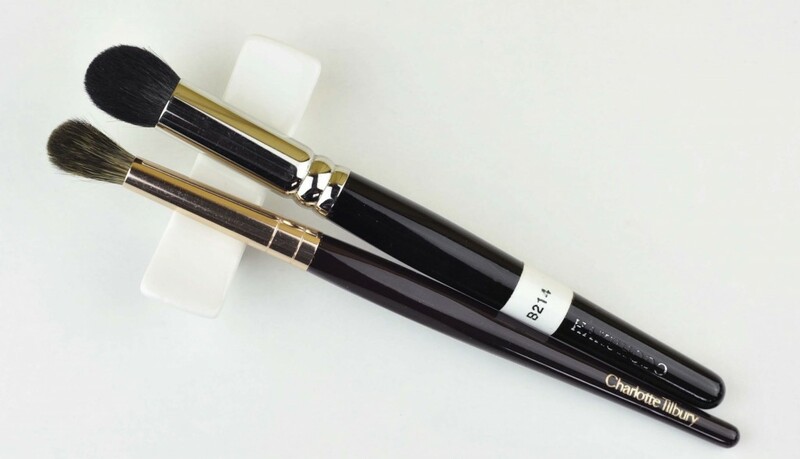 There are too many wonderful brushes out there that are higher on my wishlist. I am using her makeup at the moment and I hope I will be able to share my thoughts soon. So far I have used only 2/3 of what I have purchased from her 🙂 still some products to try. My favs are the sculpt powder that I use as bronzer, the chameleon pencil (I only have the Golden Quartz) and the Dolce Vita palette. I am in a very scientific period at the moment despite the lack of time, I am having fun like a little child in a playground with all the items I got from her or other brands in Scotland, can’t wait to share with you ! Lol, the Rae Morris magnet thing just doesn’t go away – buuuurn :D! stop it Olga 😀 you are killing me ! Thank you Sonia, for this great post!! 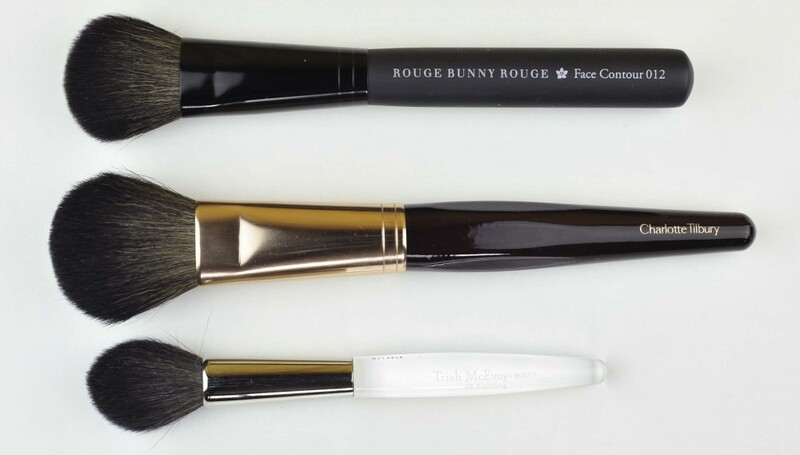 I can’t wait to try the wayne goss brushes!!!! I am a bit confused when I read Chanel #24. I checked the web-site and I don’t see it. I was going to buy #19 for blending the edge of my lower lid, upper lid and the crease. It doesn’t exist anymore, I put it there because of the similarity of the ferrule, I know many people own it and may think it is close to the CT so it was more for a comparison purpose, to show it is very small side to side. Sonia, you write at super speed and your photography work is again a success. Luckily I didn’t buy the brushes, I doubted that they can be MAC standard if an EU/US brush company is used. I think I will get the eye blender brush some day, as a collector item before my eye lids are getting too delicate…I do accept Dustyohunter’s view about “we still need to keep some of the effective but less soft brushes in our collection”. I am kind of worried for those established and general EU/ US brush manufacturers, you know, Temptalia is producing cotinuously her review of Japanese brush brands (Hakuhodo for now). 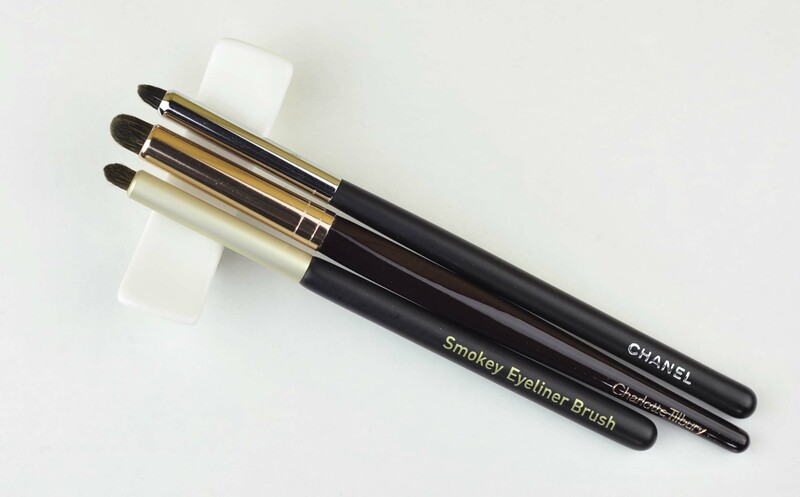 If Lisa Eldridge is tempted by any fan suggestion to buy from Chikuhodo, that would spin the trend and poise some challenge for those manufacturers, definitely? I eyed the Edward Bess and RBR for blending when I want to own sth non-MAC (I read Delicate Hummingbird back then), but 217 is performing very well and those 2 are regarded as nothing soft. And I hope you will be less and less annoyed someday with my previous frequent question posing to you for “best blending brush” or “is Paula Dorf sheer crease good if compared”. I want to let you know that I can’t thank you enough for always taking the risk and spend money on that risk to explore new brush offers, even you know there may not be a pleasant surprise. The makeup artist world is often sponsorized by brands and they may not always be able to promote competitors, for them it’s also more about the result than the tool. Same for Edward Bess, now it’s a matter of personal preference as always. My thing is to explore, just sad that sometimes I have to give not that good reviews to people I like and admire but I hope readers are taking what is worth for them and doing their own research, we can’t please everyone anyway. I kind of … watched almost 90% of his videos and can’t recall where he had said such thing. That was a simple claim made in a random video. Dustin Hunter worked with Temptalia by being a guest content provider to offer terrific videos on Halloween makeup in 2012. They so much worth taking a look, for humor at the very least. But you may want to know that he is an art based freelance for any kind of art related jobs you can imagine. He is strong with industry product technique, not a verypersonal makeup doing Youtuber. He pays less concern for skin quality and luxury brand perception. He uses TF, Armani, Guerlain, etc and he doesn’t mention those very much. What I was attracted to his videos owes to his photography accuracy of swatches, and the delicacy in cinematography, pace, film editing, blah blah blah of his videos. I am a freak for art/ new texture/ new product type/ brand specific technique, so I am quite hooked to his channel and Wayne’s. 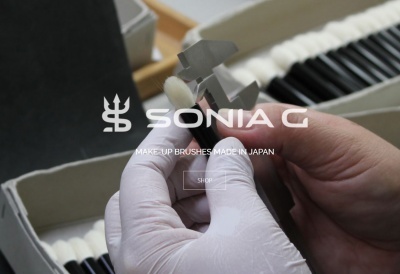 Sonia, I really appreciate you are being cool towards a partially satisfied purchase but shares so many ways to use the 3 different brushes so that we people who have put money in the brand can feel that our money spent gains something back. I do notice that, because you have shared so much more brush application tips than your general brush reviews holds. Can’t wait for you to review wayne goss brushes. Thank you Wendy, that will be done as soon as they reach me 🙂 Cheers ! I have a scratchy Burberry 11. Looks like squirrel hair to me. But my goodness, I feel quite uncomfortable with it on my eyelids. I just kept washing it, hopefully it will be as soft as those demo brushes at the Burberry counter one day. Thanks yet again for the indepth post, Sonia! I think that CT didn’t do herself much of a favour by likening her products & their colors / packaging to those of TF. The similarity just screams for comparison and she doesn’t come through as the winner. Sure,her prices are lower, but they’re still waaaaay up there in the realms of high priced cosmetics. Quite frankly, if I’m going to be spending this kind of money, I’d rather lay down a couple more $$ & get the real thing = TF . Hahaha, you are right Sonia, the CT items are NOTHING like the TF in real life. The the two lines look very similar when looking at CT’s marketing pics & the color of her brush handles & ferrules mock those of TF but once I recieved my oder today I was in shock!! I was expecting the quads to have a similar size to the TF, but they’re teeny tiny & light as a feather. In fact when I held the parcel I figured that they must have been out of stock and only delivered part of the order. When I order TF the package feels like a brick. In real life = no comparison at all ! I need to give the CT goodies a chance but I must confess that I wouldn’t have ordered a thing if it hadn’t been for the TF look-alike show. it is interesting reading all the views about the new Charlotte Tilbury range. A lot of people are commenting on the similarity to Tom Ford (including myself). Well I recently found out that it was in fact Charlotte who created the Tom Ford beauty range so that explains it all! Thanks for saving me money on these brushes, Sonia. All the more to spend on those tempting chameleon colour sticks! I was reading the forum on the new CT range.im not sure if it was u or another contributer who commented the luxury eye palettes worked best when applied with her brushes.I wonder if that was a conscious choice on the part of CT.I love your post on brushes-which launched me into Hakuhodo territory-but if her products work better with her brushes I might consider them.I am loving the products I have bought so far. Thank goodness not another thing to track down lol… I really your envy to write such thorough and honest reviews! So glad I read your review on these brushes…Saves me some money and time writing a review of my own. 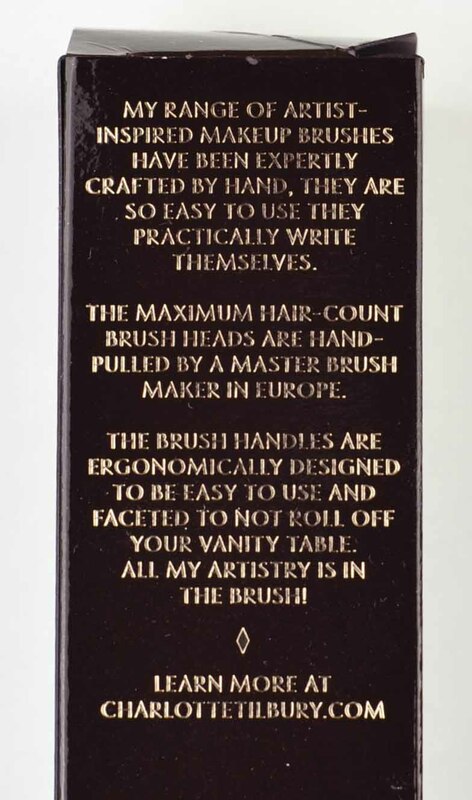 You are the brush Queen and I bow down to your vast collection. I will save up for The Wayne Goss Collection. The very best to you. Even though I won’t have many tips/advice or information to share with you,I hope you will still welcome me as a part of your “family”. Enough with my rumbling.Your review,as always,is very real,written in a very personal style with honest opinions.Very humane,in a way. I was wondering,seeing as you have the most amazing brush collection I’ve ever seen,if you would like to dedicate a post to the way you care for your brushes.I know you’ve done a storage and organization post,so I hoped you might also like to do one where you share with us how you clean your brushes,how often,the differences between care for natural and synthetic hairs,any “secret” tips you may have acquired from your visits to brush factories and manufacturers,the products,methods and techniques you use,etc.I think it would be extremely interesting if it’s not too much of a bother for you to get into. Thank you for you wonderful contribution to a world that I love.Keep up the good work and never lose your passion! I don’t think I’ll ever lose my passion, it’s going stronger since I met the people behind the manufactures and I feel I get a lot of love from you all so that keeps me going ! I’m really glad you’re interested in doing this type of post that requires so much work and research.Really looking forward to it! It’s too bad you’re sick… 🙁 I know when I am everything in the world is at fault and it’s all terrible,so I hope you get over it and get well soon!And of course,all your obligations and issues(for lack of a better word)in your real,everyday life should come first.Don’t go driving yourself up walls.After all,we’re not going anywhere! 🙂 you are so right ! I’m late coming to this party, but I wanted to comment about your Feline Flick quandary. Of course you can wear it at any age so long as your lids are still in fairly good shape. I’m 69 and often have a bit of a flick going on but I modify it to suit my features. For example, I might fade the flick out a bit as it extends beyond the outer edge of my eye so it is softer and not as harsh as a graphic line would be. I also never, ever line my lower waterline. Instead, I run my pencil under my lower lashes and blend the color up into the flick. I keep the color whisper light towards the inner corner and then increase the intensity towards the outer corner so that it matches the flick. I should also mention that I have a beautiful and elegant friend who is 76 and she wears a full on black feline eye and is simply stunning. You’re obviously much younger than me or my friend so don’t let age be the determining factor. Look at your personal style and your physical features and let those guide you. 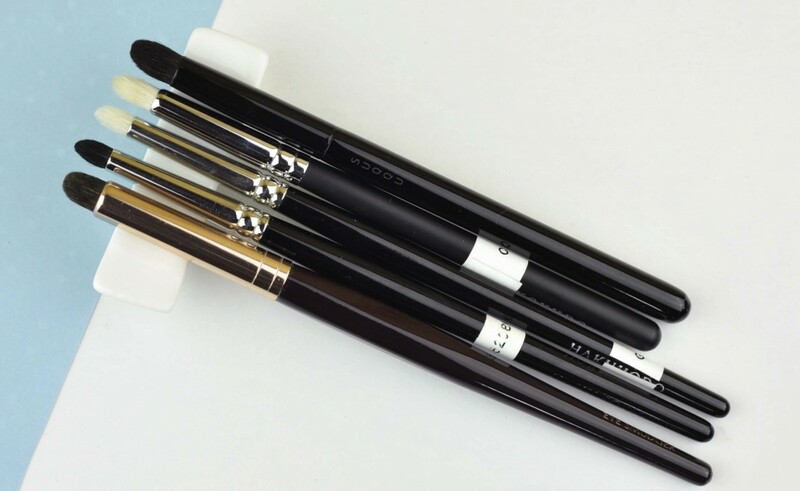 As for brushes, I’m firmly in the Japanese brush camp so it doesn’t sound like the CT brushes are worth trying. Thank you for another one of your excellent brush reviews. I totally agree with you regarding CT heavy waterline. I think she really adheres to this look because it’s her signature, because she loves it and she would probably feel naked without it but I can imagine her looking totally stunning with the more subtle look you describe you do on yourself, this look you mention is exactly what I do on a daily basis. The heavy waterline is exactly the first thing I was asked to modify the very first time I took advice from a professional and switch that dark waterline application with a softer definition with gradient intensity. Eileen, I love your “method”. It sounds perfection. I would love to see Charlotte doing one of her makeup looks on herdelf for a change. I do love her signature look but would love to see her wear another look now and again. Hi Eileen, the first time (and well, everytime) I saw (see) Charlotte Tilbury I noticed her very black eyemakeup and thought that she lacked objectivity on what suits herself. The black liner is so harsh and not in harmony with her own warm colouring, and I think her flick draws her eyes downwards instead of upwards. I caved in and bought the eye blender brush. Although the brush performs well and is soft on my lids, I am finding that it is losing hairs. I wondered if your eye blender is / or has done the same. I am asking as I am thinking of returning the brush. I personally don’t expect to lose a single hair out of a £25 make up brush! I understand you, mine hasn’t shed and I have been using it and washing it to make sure but so far it’s ok. If you have the possibility of returning it, I would do it. For a little eye brush better that it doesn’t shed, did it shed a lot ? for the face brush yes it has shed a few hairs but nothing too alarming for now. I am not crazy about it at all but that’s more due to the lack of softness of the bristles. Hello, I found your page while searching for a blog sale for the #24 Chanel brush that I want desperately but is horribly discontinued. 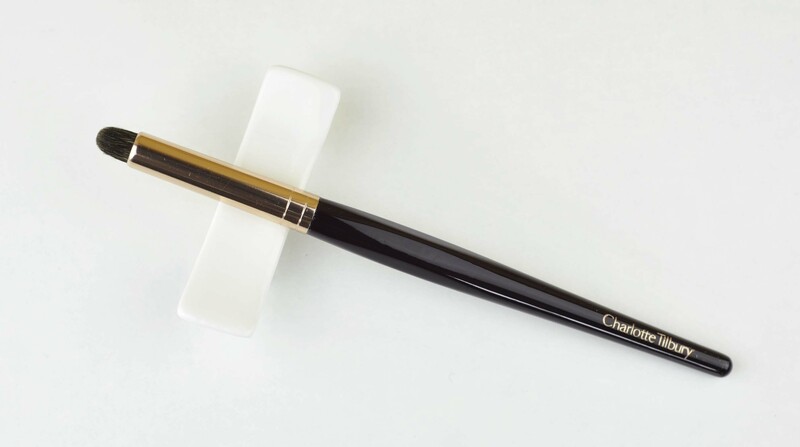 Reading this post it’s clear you’ve got an great knowledge of higher end brushes and I wondered if you might have an idea of a brush that could dupe for the Chanel 24. Any help would be GREATLY appreciated. Thanks! I totally see what you mean, the 24 is really very nice and unique, I find myself looking for dupes but they do not compare at all, this Chanel is a work of art, the application of shadow is really smokey, never streaky, never too light or too strong. 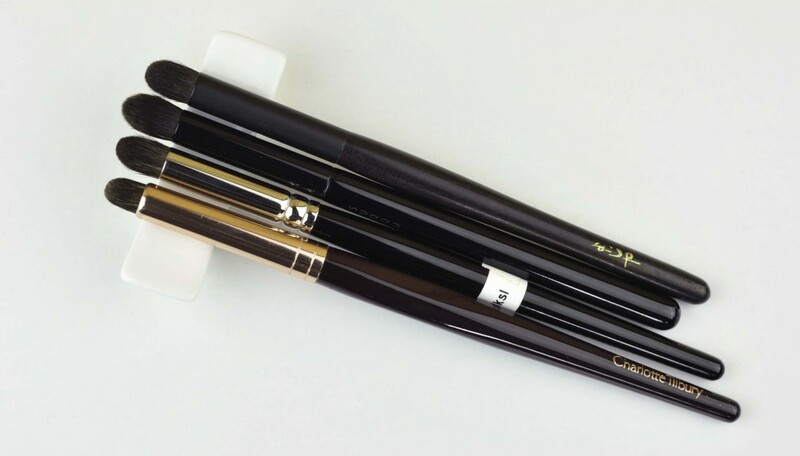 The one that comes closer is either the Koyudo C011 or the G5514 from Hakuhodo.